The Russian government has given the go-ahead on an ambitious new tunnel project that could connect Siberia with Alaska via an underground rail line. If completed, the $65 billion project will be the longest underwater tunnel in the world, besting the Chunnel between England and France by twice the distance. The planned course would stretch over 65 miles and would snake beneath the Big and Little Diomede Islands. According to Inhabitat, the project will be funded by a private and public partnership. So why build it? Aside from being a civil engineering marvel, the tunnel would also provide an efficient way to move 100 million tons of freight per year. 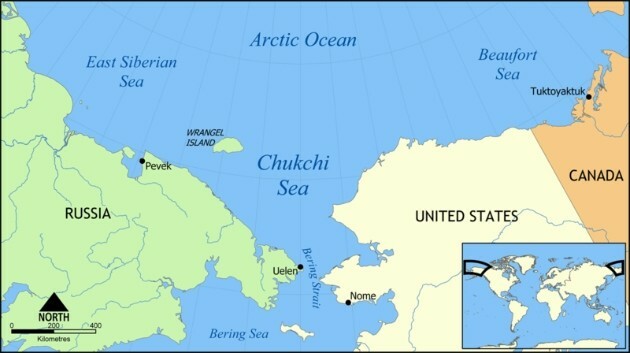 In addition, the tunnel could provide an easy transmission route for electricity developed by tidal energy stations and wind plants in Russia to Alaska and Canada. In addition, the rail system would complete a high-speed network that could stretch from London to New York City. Unfortunately, the project doesn't seem to be geared toward passenger travel. At least, not for now. Thanks for the tip, Chad!